So many opportunities to learn! From intensive 1 or 2 day classes from a famous visiting artist to short meeting demos, to observing fellow member’s work at a Clay Day there are many opportunities to learn, share and grow. A Weekend Like No Other! Here we gather for a long weekend of uninterrupted claying, away from our everyday lives, televisions and other daily distractions. Explore new ideas, gather inspiration, make new friends. 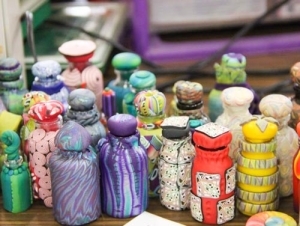 Bottles of Hope for Gilda’s Club, Beads of Courage, Hearts for Heroes. Many of our members reach out to the community. We strive to raise awareness of polymer clay as an art form, provide a forum to exchange ideas and inspiration, and provide education through classes and demonstrations. The Metropolitan Detroit Polymer Art Guild began in 1993 by a small group of polymer clay artists under the direction of Marie Johannes. Twenty six years later, our group has grown to over 50, with members from not only the metro Detroit Area, but from all over Michigan, as well as several from out-of-state. We are an enthusiastic group of clayers, ranging from the beginner to the seasoned veteran. 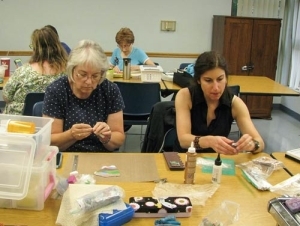 Besides polymer clay, our members are diverse in their skills and interests, including doll making, jewelry, sculpting, book making, painting, stamping and mixed media. Together, all this talent creates a rich and exciting setting to cultivate and spark creativity! Some of our membership have taught workshops all over the country, written articles for craft magazines, and many have their work featured in polymer and other craft books. And from the beginning, our annual retreat has attracted clayers from all parts of the country. We would love to have you join us at our meetings and become an active member of our guild. We are always interested in meeting other clayers and making new friends. See you there! All of MDPAG’s events are listed here! Check this calendar often, something is always going on. Saturday Meetings! 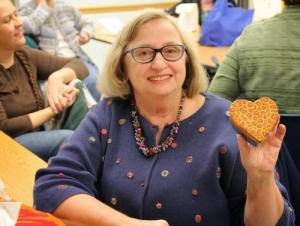 – MDPAG meets on the third Saturday of the month for a combined meeting and Clay Day. Meetings are held at the Holy Trinity Lutheran Church in Livonia, MI. Meetings start at 10:00 am, but there’s time to mingle, see what your old friends have been up to and make a few new ones too. Plan on making a day of it, stick around for the Clay Day afterward! 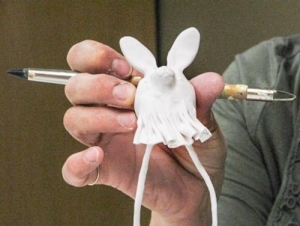 Members are encouraged to bring in their clay projects to ‘show & tell’, as well as share information about techniques, new books, magazine articles, as well as products and tools! On occasion, our members do demonstrations, if time permits. Come in early and check out our extensive, and ever growing library of polymer clay books and videos. MDPAG has a long history of sponsoring educational opportunities for our members. 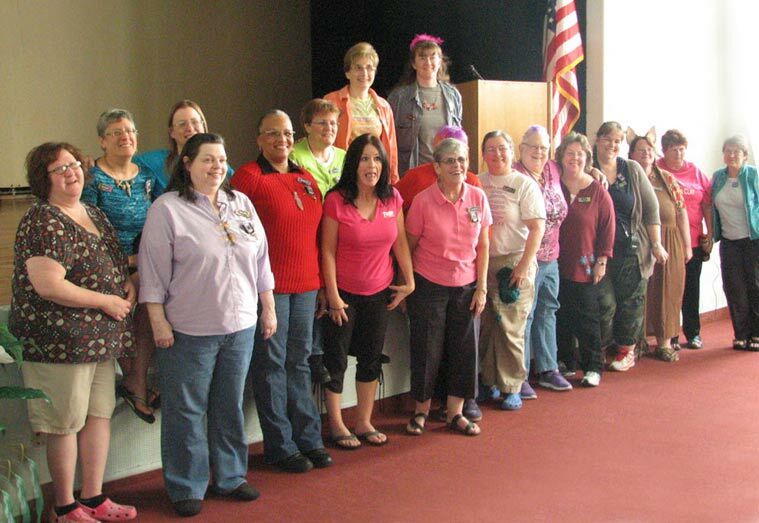 We usually bring in one or two nationally recognized polymer clay instructors each year. In addition, we offer ‘Members Only’ classes taught by our own talented members. 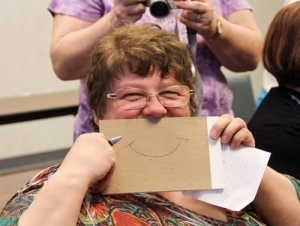 Another perk of being a member in good standing is the opportunity to take a class through our Trina’s Way Program. 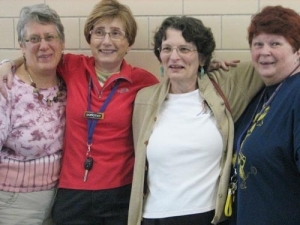 This program, established in 2007 is in memory of Trina Kern, a longtime guild member and past President of MDPAG. Read more about Trina’s Way here. We are always seeking new and fresh approaches to polymer clay and welcome class proposals from polymer clay instructors. To learn more, contact our Education Coordinator Susan Kaplan. 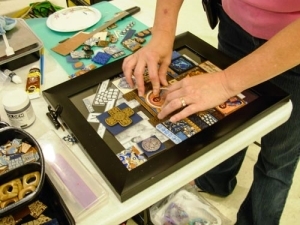 Every Spring, MDPAG holds a 4-day clay fest at the Columbiere Center in Clarkston, Michigan. Here we gather for a long weekend of uninterrupted claying, away from our normal routine and other daily distractions. Meals are prepared and served cafeteria style, so no dishes to do either! 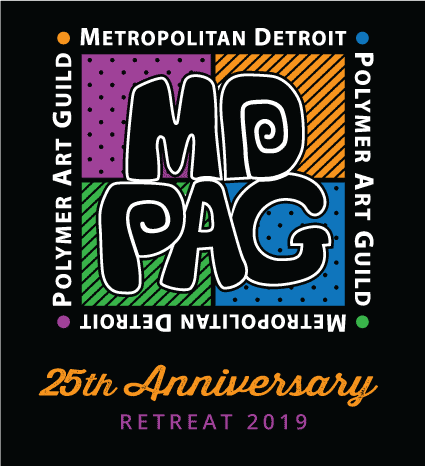 MDPAG Retreat is a wonderful chance to explore new ideas and gather inspiration as well as create lasting friendships with other clayers from near and far. There are demos with the featured Guest Artist, as well as our own skilled members, sharing their techniques and years of experience. Our Board puts together fabulous Goodie Bags for everyone, often with new products to try. If you love polymer clay art like we do, our Silent Auction is a great place to add to your collection. All in all, in it’s an experience like no other. Although MDPAG members like to have fun and exchange claying information at our meetings, at clay days, and at Retreat, we also share a concern for our communities. Most of our meetings are conducted in the metro Detroit area, but our members come from far and wide – from Michigan and beyond. We are establishing a formal Outreach arm of the guild to help “spread the word” about polymer clay among the uninitiated. Spreading the word is even better when we can help others in the process. In the past we have done such things as creating themed polymer decorations for holiday trees to be auctioned to benefit Children’s Hospital and making Bottles of Hope to help provide some emotional support to people who have cancer. Future outreach activities include displaying our art in public venues such as libraries, hospitals, and citizens’ clubs. And, if you have a location that could use a polymer clay exhibit, please contact Outreach Chair Kathie Harroun or any Board Member. After every Saturday meeting we stay for a Clay Day. It’s a great opportunity for members to learn and share with other guild members. Clay Days after 1:00 pm are open to the public. The MDPAG is proud to sponsor our full-color, quarterly newsletter, ‘The Newsletter’, now in its 18th year. It is edited and designed by Dorothy Greynolds, who does an outstanding job of keeping all our members up to date on guild events such as swaps, upcoming demos, workshops and Clay Days, to name a few. It’s filled with lots of informative tidbits, in addition to interesting interviews with MDPAG members, and also other nationally known artists, as well as reviews of new polymer clay book and video releases. See current issue in the Resources section below. MDPAG members enjoy the privilege of access to our extensive book and video library. Our Librarian makes sure our selections stay fresh and updated. This material offers a fun and affordable way to continually learn new techniques and be inspired by new and established artists in the polymer clay world. For the past several years, many MDPAG members have participated in organized swaps of their artwork. Each year the group has selected a theme, established guidelines, and worked to produce swap items. 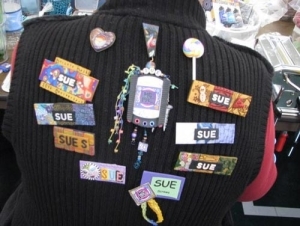 In addition to participating in the annual swaps, members may contribute whenever they want to an ever-growing strand of beads. 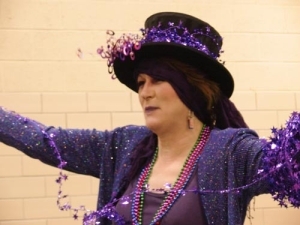 Some members have several beads on the strand while others have not yet donated a bead. We even have some beads donated from visiting instructors. 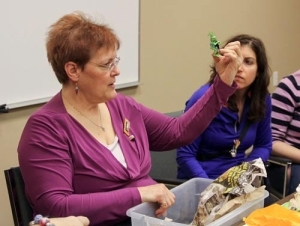 The beads provide members an opportunity to share their work in new areas of interest or in areas of their expertise while using relatively little clay. MDPAG is on Facebook. You can also chat with other members on our Yahoo Members Only Group. Last but not least, this website! Check back here often to see fellow members work in the Gallery section (Our Work), the calendar of events, member benefits, and links to other polymer clay sites around the web. Don’t see one of your favorite websites here? Get the information to Webmaster Linda Vilas-Helton. MDPAG Retreats just keep getting better and better, join us as we celebrate our 25th Annual Retreat! Three days of uninterrupted good friends, good fun, and good clay! This year’s guest artist is Kim Cavender. 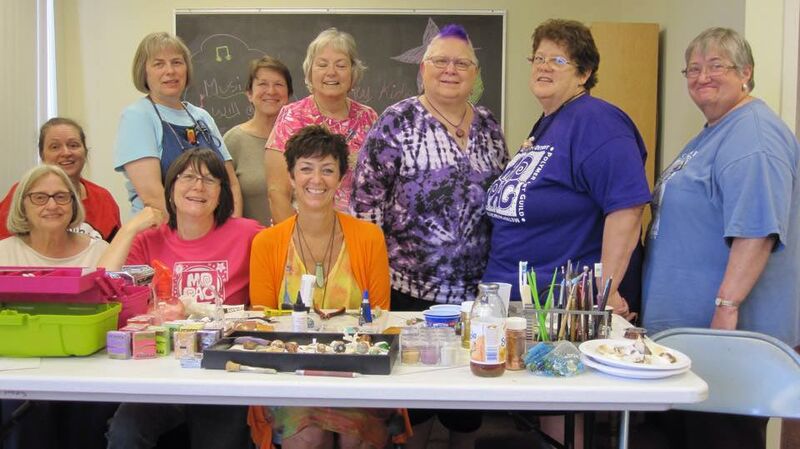 Polymer Clay Fests: Cabin Fever Creative Arts Fest, Master Class Camp, and Creative Fiber/Mixed Media Arts Fest (October) events. SHOPPING…Look for tutorials on some of these sites too! Munro Crafts is a BIG supporter of MDPAG!